... or: "Best stringing machine for the money?" When I decided to spend more time back in Europe, I sold my second stringing machine, the Gamma Progression ST II (my review here). Back in the motherland, I set out to find the stringing machine with the best price/performance ratio. Or in other words, at what price point could I find a complete package, without deal-breaking sacrifices? In addition, no deal breakers please, e.g. pink with yellow hearts on it, no terrible reviews etc. After some research, it became clear that a combination of a solid base with the latest version of the Wise Tension Head would make the most sense. Both parts should have come pretty far in their respective development, and each is reasonably priced. So there is some protection on the bottom, left, and right. However, there's still play towards the sides, and most concerningly, the machine can move up and down quite a bit. When we (2 people) carefully lifted the machine out of the box, one of the feet already fell off. After that, I wasn't sure if the play in the sidearms I noticed later comes standard... Definitely concerned what a machine with moving parts would go through in this packaging from the factory to my doorstep. Another surprise was that the included manual was for the F40, instead of the T50 - not even a note attached. The rubber mat that's glued to the tool tray was too long. The "glue job" was poorly executed, plus the glue smelled pretty bad. Then if you lift the mat, it gets even uglier. I ended up removing the matt altogether and cleaned the metal as best as I could - looks much better now. Why not omit the mat altogether? Not all screws were tightened properly and evenly - some too loose, some too tight. As a customer I probably shouldn't have to think about this, and if I do, how do I know how much I should tighten each screw? No starting clamp included, so that's another ~$50 on top. Other tools are included, not exactly premium but function OK. The plastic mounts locking in the frame each had a sharp seam in the middle - not nice to expose your beloved frames to that. I carefully sanded them off with fine sandpaper. Also, you cannot lock the turntable, e.g. to pull strings at an angle (sorry, Prince Speedport racquets). So overall a bunch of serious quality issues, which could easily be addressed! The look and feel is more solid than the official images would suggest, mostly due to sufficiently big swing arms and screws. Looks quite elegant in all-black, too. So far no issues whatsoever with the semi-automatic clamps - easy to move, clamp, and release. Maybe even more importantly, they give in very little to the pulling and releasing of the string, would estimate less than 1 mm. Sometimes they do shift sideways upon locking - when that happens, a quick reset does the job. If you're not familiar with semi-automatic clamps: their lock to the turntable releases when you let the clamp drop onto its base. That saves as many steps as there are strings to pull. The side-arms move in at the same time and thus automatically center the racquet - simple, saves time, and evenly locks in the frame. We're already at v12 of the Wise Tension head, and it shows. It seems like a solid work horse that delivers consistently - for the most part it's been set it and forget it. After stringing about 50 racquets the sled started to get stuck, but a careful application of oil onto its bearings solved that issue. Would recommend the Tension Head to anyone who wants to go electric. Subjectively, the string could slide a bit deeper into the gripper - that might partially be user error, but would be nice if that wouldn't require conscious effort, or 2 hands. Either way, it's slowing me down a bit. You don't need the optional foot pedal since your thumb is right next to the button when you put the string in the gripper. As mentioned above, the gripper bearings will need some oil from time to time. For lack of better options at hand, I used some clear bike chain lube, which seemed to work well and last quite long. Just be careful - start with a tiny bit, and avoid the inside and top of the sled that grabs the string. Otherwise no more grabbing the string! The swing arms have some play, and that play might not even be 100% even on both sides. Also, the frame is held by the 2 x 2 sidearms and the 2 center mounts, and doesn't actually rest on the rubber pads on each end. I had to experiment a bit to get the racquet to sit tightly. It still has some play vertically, probably due to the rather wide angles of the mounts, and the gripper / diablo pulling the string slightly downwards (so that you can rotate the racquet handle over it). Since I usually string with pretty low tension I'm not too concerned with that in practice. Superstringer surely cut some corners putting this package together, which left me with a negative impression of the brand. Most issues seem easily fixable, so hope they'll start cranking through those in the very near future. In the meantime, once you've done that work for them, you get the most important high end features, and no deal breakers. At least that's the case for me. For my string jobs, I felt that I've not been sacrificing speed, quality, or consistency, even compared to $10,000 Babolat or Wilson machines. Overall, this might be one of the top 3 machines for the money. As with most things, hope it'll get even better over time! *Update 2016-12-06: Supposedly you can now lock the turntable, and the rubber matt glue job has been improved. Things are moving in the right direction! For most of my tennis life, I had the luxury of stringing my own racquets in a sports store. This tends to come with a few advantages: you get to use a great machine, try a bunch of strings and experiment with different tensions, and most importantly, you're in total control of how the string job turns out. There are quite a few variables that determine how the racquet feels back on court, and if you care about this, either get a really good stringer who caters to your preferences and feedback, or get a machine and string yourself. Back in 2005, after a couple of international moves and less tennis than usual, it was time for me to take the game a bit more seriously again. In Ireland, I joined a team that played in the highest Irish league for 2 out of 3 seasons a year, and had aspirations to go up in season #3 as well. So it was pretty competitive. Finding and accessing a great stringer turned out to be a challenge, so I decided to purchase my first machine. I had exclusively worked on electronic machines and enjoyed it, however I was not ready to spend thousands of Euros on a Babolat or Technifibre. So I went for a solid budget machine, a less than 500 Euro Pro's Pro TX-03 (available in the US as Eagnas TX-03), and was quite happy with it for a few years. I even moved it from Europe to NYC in early 2007, distributing parts of the 60+ lbs across 3 bags which I schlepped through airports and subway stations. I'm glad I brought it though, even though the fuse didn't hold what the 220/110 volts switch promised. A converter solved that problem. After extensive research and consultation with my gear specialist, I decided to go for the Gamma Progression ST II, with an eye on the Wise Tension Head. 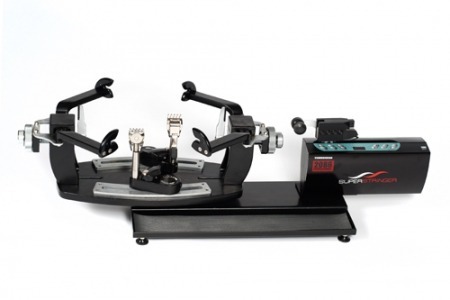 Main reasons: great clamps, solid turntable, diablo tension head, and Gamma's experience in the business. I ordered from ATS Sports which are in the same building as Gamma, just in case I'll ever need a quick repair or replacements parts. Discounts on stringing machines are hard to find, so prices were pretty similar everwhere I looked. ATS's customer service has a good repuration too. Indeed, they were helpful to accomodate a pick-up at a FedEx location when it turned out that the machine would arrive on a Saturday, so I was able to use it on the weekend. Shipping across the country took 5 business days. At first, I was a bit sceptical about "stepping down" from an electronic to a crank machine, but I have to say that there are elements I enjoy about the new experience. I found it intriguing to have a 100% manual solution that seems to have been refined over time. You can actually see most of the parts in action. Everything works as it should and the strung racquets feel right on court. Since I like looser tensions I don't care as much about linear pull which you get with the better electronic machines, but depending on your preferred tension and string you might want to consider this. For me, I think I'll keep the crank until it needs servicing, and then I'll determine whether I'll go for the Wise or not. I'm particularly excited about the light aluminum turntable and the great clamps. They move well, are easy to adjust, and do not move once set. All in all, I'd buy the Progression ST II again, and would recommend it to all occasional yet demanding stringers out there. You can find more posts on stringing (UPDATE: including the stringing machine I bought after the ST II) here. OK, now that you have seen the wide range of tensions in my previous post, I wanted to tell you about my own thoughts and experiences. I only found out by accident that I enjoy lower tensions. I once grabbed a Wilson Hammer 7.2 demo racket from my sports store, and on court I realized how loose the string was. The string itself looked very cheap too, so it almost seemed not worth to trying at all. I wanted to see how the racket swings though, so I started hitting a few balls. To my surprise, it felt amazing! I felt I could do anything I wanted in a very natural way, and all of a sudden most of my previous 15+ years of tennis felt like a big struggle against the game. I kept on playing with the racket for the next days. The racket was nice, but it was the tension I wanted to enjoy as long as possible. When the string finally broke, I tried to make the racket feel the same again, but I couldn't get close. I used to string my rackets between 25 and 28 kg (~55 and 63 lbs), so I decreased the tension by a few kg, down to 24/23 (52/51 lbs). It did feel a little looser than I was used to, but even with a simple Prince Tournament string I felt I had too much power and not enough feel. Only later I realized that there is a tension that gives the maximum bounce, and as you go lower you can take away a bit of power again and gain even more feel. This is where I felt comfortable. For the next 5 years or so, I ended up playing an elastic monofilament string at 23/22, and recently went down to 21/21 with the same string on my new racket. So what felt so good about playing a loose string for the first time? Well, it just feels easy. You can hit right through the ball, easily apply spin, and play with depth and power without much effort. A lot of people say that you lose control as you go lower, however I *feel* more control, and play so much better overall that playing it loose is a no-brainer for me. If you ever felt that you had to work hard to get good pace on the ball, or had no "touch", or tightened up in anticipation of making contact with the ball, you might want to give it a shot. Drop your tension to the low 20s (kg) or mid 40s (lbs), and see what happens. Do this when you feel like experimenting, and when you have some time off from competition. A little heads-up: Playing might suddenly feel very easy and you might have a lot more power than you're used to. With that, you might tighten up your arm to keep the ball in. This obviously defeats the purpose of making playing more effortless and more fun! Remember, if you loosen up your string, stay loose as well. You might also become a bit lazy on your ground strokes because you don't have to work that hard. Just keep an eye on the amount of spin you're applying - that should keep you swinging right and produce more effective and safe shots. Happy loose hitting, and let us know how you find it! As I mentioned in my intro post, I used to string rackets in a sports store, which gave me the opportunity to try and compare many different strings over the years. However, for a long time I didn't really think of experimenting with different tension (plus I always ended up with the same string anyways, but more of that at a later time :). While there has been a lot of buzz about strings recently - especially Luxilons - tension is often overlooked. Tension also has a major impact on how comfortable you feel with a racket (and on court in general). · The lowest tension used was 22 lbs mains and crosses using Luxilon Original – by a 6'+ man..! I highly recommend checking out his page for more info. If you'd like to translate lbs into kg, you can simply ask Google.